Oh, my Big. He’s a funny one. Last year after claiming he didn’t want to invite any friends to his birthday party, he ended up with a whooper at a jumpy house place. (And since I ended up on bed rest the same week, I couldn’t have been happier that they did all the work for me.) This year, well, he pretty much said the same thing. Only this time it stuck. No matter what I said, he really just wanted a couple of his buddies to come over to play football. It wasn’t that he was trying to be exclusive, he just knew exactly what sounded like fun to him. And, since it was his party and all, I had to respect that. I’m going to blame the rise of Pinterest and my guilt over missing so much of his birthday fun last year for my efforts in making this itty-bitty party so fan-football-tastic. But, hey, I got a blog post out of it, so that’s something. 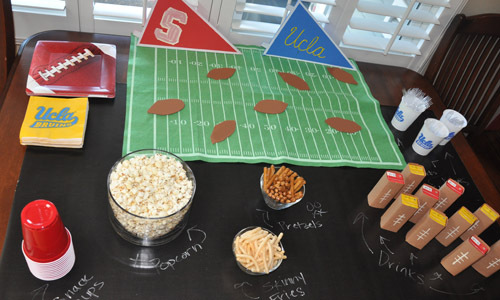 Here’s how to throw (pun intended) one heckuva football party for kids. So, I ran out of time on this front, but my plan had been to create invites that were draft cards (especially since there were only a few invites to be made). “You’re Been Invited to Big’s 6th Birthday Draft” or something like that. 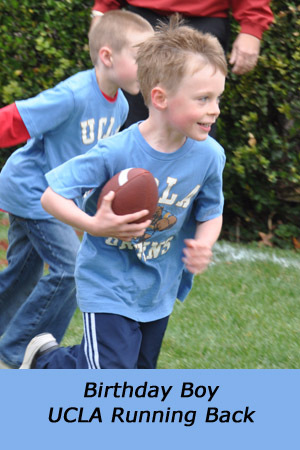 Since we’re big UCLA fans and we live in Stanford territory, those were the two teams. While most parties end with a goodie, we started ours with one. 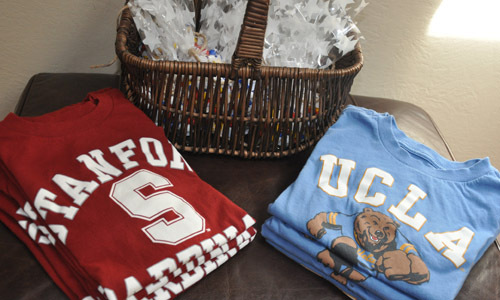 As each boy arrived, he was given his team shirt—Stanford or UCLA (bought at Old Navy). I also bought chocolate balls (and mixed together both team colors) as a parting gift. Since I usually do CDs as favors, I considered making a sports mix, but ran out of time. Birthday Banner– I bought 9×12 pieces of yellow felt at Michael’s. I measured 3 inches and 9 inches in on one of the long sides and 6 inches in on the other. I drew lines from the top corner to the bottom 3-inch mark. From the bottom 3-inch mark to the top 6-inch mark. From the 6-inch mark to the 9-inch mark. And from the 9-inch mark to the top corner. (Looks like a big W.) I cut along the lines to create 3 flags. (Note: Be sure to draw your lines on the side of the felt you’ll consider the “back”.) I bought blue iron-on letters and made footballs out of brown felt (glued on) for the ends (both bought at Michael’s). Using a hand-held hole punch, I made small holes in each corner and threaded the flags together using Jute (bought at Ace Hardware). I put a dot of glue on the top corner of each flag so they’d stay together, but the jute held them in place well without it. Call It Like It Is Snack Table– I covered the table in black wrapping paper and figured out where all the snacks/utensils/etc would be placed. I used a piece of chalk to write out what everything was so it looked like a game plan. (And tried to stick to sporting event snacks like popcorn, pretzels and fries.) This was a bit lost on the kids, but I still love the idea (which I came across on Pinterest, of course). Big also happens to have a beloved game called “Football Guys”, and I used the felt football field to break up the table. 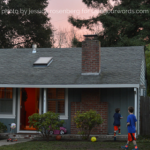 (Foam footballs with the kids’ names are fun to place here—see games.) I also found the blank pennants at Michael’s and attempted to create the team banners with fabric paint. 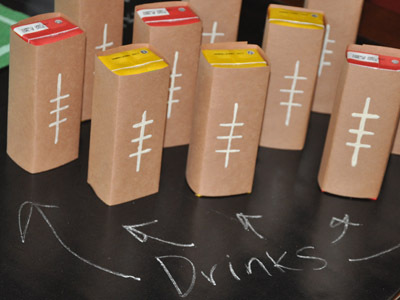 Football Juice Boxes– Again, my thanks to Pinterest for this idea. I removed all the straws, cut brown construction paper to size, used fabric paint to draw the lines (though my mother-in-law had a great idea to use correction tape), then wrapped them right before the party and added them to the snack table. Football, Obviously– Let’s face it, this was all Big needed to have the greatest party ever. We (as in Lenny) went all out buying lawn-safe spray paint and creating a field on our front lawn (yes, neighbors, we’re glad your house is already sold, too). We also bought this really cool goal post that the kids loved. Having my father-in-law as the ref was the official end all and be all. 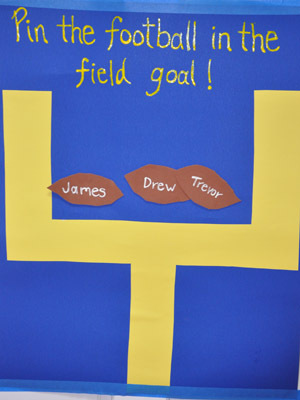 Pin the Football in the Field Goal– I bought poster board in blue and yellow and cut/glued the goal post on. I painted with fabric paint (because I have more control than with a paint brush). I traced a small football we have on a piece of brown foam and Big cut out the footballs. I used fabric paint and painted each kid’s name on a football (used in decor before the game). I added a glue dot on the back as each kid came up to be blindfolded for his turn at the game. They played about three times before they headed back outside for more physical fun. Check out my Pinterest Board to see my inspiration and get even more ideas. 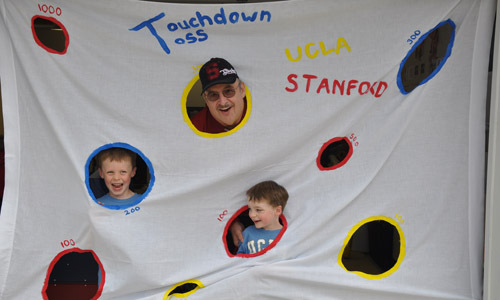 Have you seen or created any other fun ideas for a football party? 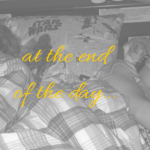 Please share and feel free to include links so I can add them to my board! Disclosure: This post includes Amazon affiliate links. This is amazing!!! So creative!!!! this is absolutely incredible! what a fun idea, fabulous details, and a good time :)! Happy 6th big guy :)!!!! This is awesome! Can’t wait to copy this idea in a couple years! Happy birthday to Big! Lenny may not let me host another party. Ever. So probably not. But I have all the stuff you can borrow! Big’s football themed birthday party has really raised the bar! It was perfect…you didn’t miss a thing! Martha Stewart better watch out…Here comes Amy! I used to be obsessed with Martha (you know, before I had kids), but I fell so far short, I gave up and went the other anti-crafty extreme. I have the ideas, but execution is another story. All of this was sooo easy. I love all of these ideas! I’m planning my sons football themed party for this weekend and I will totally be copying some of these games:) Thanks so much for sharing! Happy Birthday to your football lover! So glad you found these ideas and I hope you have fun with them. OMG Amy, My son would love this party. We have football guys too and normally host a kidcentric Super Bowl shindig, but are skipping this year. i know your post is a couple years old but I just came across it as I’m looking for ideas for my sons bday part this month. Do you remember where you got the goal post?